Golf Archives - Shelving & Racking Ltd. Golf Lockers with a stylish design. Type A Golf locker has a full height door as seen in the picture and the type B golf locker comes complete with a base well and shortened door to accommodate a golf bench without obstructing access. 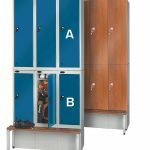 In addition to the full range of colours below, the golf lockers are available in four wood effect door and end panel options. Select standard colours or wood effect when ordering and we will contact you shortly after your purchase to confirm your preferences. All locker prices include free delivery to mainland UK. Lock options: Standard key lock, with 2 keys included, Hasp and Staple allowing easy use of padlock fitting.